Maus Contemporary represents the Estate of Eugene J. Martin (1938 - 2005). 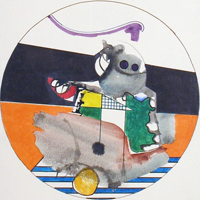 Eugene Martin is best known for his imaginative, complex mixed media collages on paper, his often gently humorous pencil and pen and ink drawings, and his paintings on paper and canvas that may incorporate whimsical allusions to animal, machine and structural imagery among areas of "pure", constructed, biomorphic, or disciplined lyrical abstraction. Martin called many of his works straddling both abstraction and representation "satirical abstracts”. Black artists may have been marginalized, but one can no longer dismiss them as outsiders. They have been as central to Abstract Expressionism as Norman Lewis or Charles Alston and as central to the shaped canvas of the 1960s as Al Loving or Sam Gilliam. They have been as central to the space between abstraction and representation as Hale Woodruff or Beauford Delaney. They have been as central to the full recognition of women artists as Howardena Pindell or Alma Thomas, and they are central to art today. The distinction takes on special urgency for a black Southern artist only now gaining his due, Eugene James Martin. Martin almost fits the fashion for outsider art, and if that will help others discover him, terrific. Yet nothing is half as naïve as it may seem. 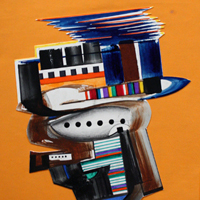 Born in 1938, Martin studied at the Corcoran in Washington, D.C., and his work makes plain his knowledge of Cubism, including its spatial density and collage technique. 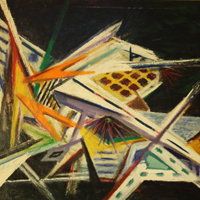 Yet he also knew the bolder colors and outlines of postwar American art. His drawings, in overlapping curves of graphite or pen and ink, treat black and sepia as the rich colors they are for him as well. He started out playing jazz, and one could call that a key influence, too. He worked quickly in both acrylic and collage, like a born improviser bouncing off others in a band. Martin sometimes described his art as “satirical abstracts,” knowing full well that it is not at anyone’s expense. Yet the label does get at the seriousness, the comedy, and the eclecticism. For him, art cannot leave personal experience behind. That may be why a figure keeps making an appearance in Martin’s work, even at its most abstract, and to judge by early titles like Detective Jones or Food and Drugs, he could be on either side of the law. He could be wielding what looks like a hammer, in another work from 2000, before deciding whether abstraction can survive the blows. Now that abstraction is back, big time, but often touched by representation, Martin’s questioning is newly relevant. Like many younger artists, he might have leaped straight from the clarity of an earlier Modernism to American Pop Art and the graphic novel, while some of those floating fields of color do have a parallel in Hans Hoffman. One can see him putting abstraction through its paces, but with plenty of interruptions along the way. Paintings from the 1990s, just before and after Martin moved to Louisiana, have a newfound energy, but also a greater simplicity. Their ground now looks like a grid, although a line of one color might leap across a rectangle, over a brushier green, to land on the other side. In his last years, before his death in 2005, his art becomes sparer, purer, and also less regular. Its subject might be a single descending brushstroke, but then Martin’s real subject was painting all along. And painting here begins and ends with abstraction. Black Southern art can hardly avoid questions of identity in those enigmatic figures and the space in which they live, and Martin’s color contrasts resemble those of Jacob Lawrence and Romare Bearden. Yet that just adds to the ongoing riddle of whether one can distinguish an African American abstraction—and how. One might look for answers starting here. 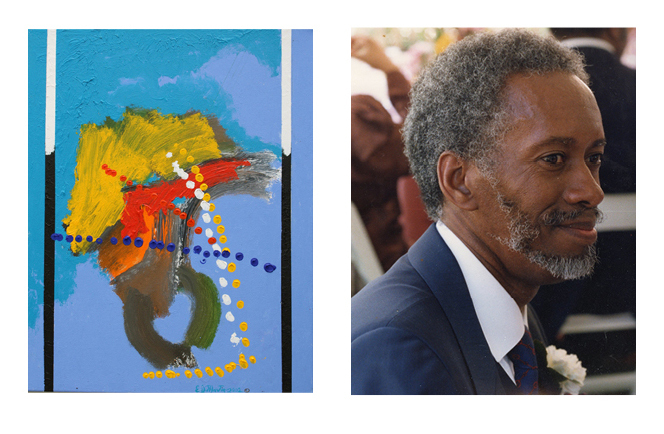 Eugene James Martin (Washington, DC, 1938 - Lafayette, LA, 2005) is known for his often gently humorous works that may incorporate whimsical allusions to animal, machine and structural imagery among areas of “pure”, constructed, biomorphic, or disciplined lyrical abstraction. Martin called many of his works straddling both abstraction and representation “satirical abstracts”. His work is included in numerous Museum collections, including the High Museum of Art, Atlanta, GA; the Ogden Museum of Southern Art, New Orleans, LA; the Alexandria Museum of Art, Alexandria, LA; the Stowitts Museum and Library, Pacific Grove, California; the Schomburg Center for Research in Black Culture, New York, NY; the Paul R. Jones Collection of African American Art, University of Delaware, Newark, DE; the Mobile Museum of Art, Mobile, AL; the Sheldon Museum of Art, Lincoln, NE; the Ohr-O’Keefe Museum of Art, Biloxi, MS; the Masur Museum of Art, Monroe, LA; the Louisiana State University Museum of Art, Baton Rouge, LA; the Walter O. Evans Collection of African American Art, Savannah, GA; and the Munich Museum of Modern Art in Munich, Germany. 2013. ASC Project Space @ Gallery 304 (526 W 26 St, room 304), Chelsea, NY. 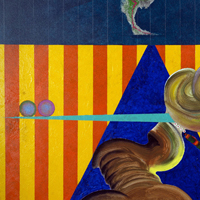 Satirical Abstraction: Works of Eugene J. Martin. July 19 - Sept. 30 (solo show). Curated by Ayn S. Choi. 2012. Masur Museum of Art: Monroe, LA. Improvisations in Time: Eugene J. Martin and the Masur Museum of Art. Aug. 4-Oct. 25 [68 works of art] (solo show). Curated by Benjamin Hickey. 2012. Ohr-O'Keefe Museum of Art: Biloxi, MS. The Art of Eugene Martin: A Great Concept. June 5-Dec. 1 [39 works of art] (solo show). Curated by Barbara Johnson Ross and Denny Mecham. 2011. New Orleans African American Museum: New Orleans, LA. Dancing String Bean: Paintings and Drawings by Eugene Martin. Apr 6-Sept. 17 [29 works of art] (solo show). Curated by Marie Vinouze. 2011. Louisiana State University Museum of Art, Shaw Center for the Arts: Baton Rouge, LA. Beyond Black: Ed Clark, Eugene Martin and John T. Scott. January 30-May 8 [16 works of art] (3 person show). Curated by Natalie Mault. Beyond Black in Context, Gallery talk by Mora Beauchamp-Byrd, Feb. 3, 2011. 2009. Cajun Spice Gallery, Lafayette LA: Eugene J. Martin: Spice of Life. Nov 14-Dec 10 [32 works of art] (solo show). 2009. Acadiana Center for the Arts, side gallery: Lafayette LA. Eugene Martin in Black and White. Jan 10-31. [75 works of art] (solo show). Curated by Rose Macaluso Courville. 2008. Chico Municipal Building Art Gallery: Chico, CA. Jerry Harris & Eugene Martin. Jan. 15-Feb. 29 (two person show). 2007. Walter Anderson Museum of Art, Jo Love Little Gallery: Ocean Springs MS. Eugene James Martin: Man of Color. June 22-Sept 30 [33 works of art] (solo show). Curated by Patricia Pinson. 2007. LSU Alfred C. Glassell Jr. Exhibition Gallery, Shaw Center for the Arts: Baton Rouge LA. Eugene James Martin: Works on Paper. June 2-30 [41 works of art] (solo show). Curated by Malia Krolak. 2007. Alexandria Museum of Art: Alexandria LA. Eugene Martin: Retrospective. April 13-June 30 [113 works of art] (solo show). Curated by Anne Reid. 2006. Stowitts Museum: Pacific Grove CA. Eugene Martin and all that Jazz. Sept 14-Dec [75 works of art] (solo show). 2006. University of Louisiana Dupré Gallery: Lafayette LA. Works by Eugene Martin. March 1-Apr 28 [36 works of art] (solo show). 2006. Black Heritage Gallery, McNeese State University: Lake Charles LA. Eugene Martin. March 16-Apr 28; curated by Stella Jones Gallery, New Orleans LA [22 works of art] (solo show). 2006. Ema's: Lafayette LA. Art by Eugene J. Martin. Feb 19-June 11 [30 works of art] (solo show). 2006. 307 Club downtown: Lafayette LA. Remembering Eugene Martin. March 11-29 [11 works of art] (solo show). 2005. Cité des Arts: Lafayette LA. Eugene J. Martin: Two Years in the Life of an Artist: 1978 and 2002. Aug 8-Sept 10 [28 works of art] (solo show). 2005. Café des Amis: Breaux Bridge LA. Eugene Martin. Jul 18-Sept 11 [29 works of art] (solo show). 2005. Acadiana Center for the Arts: Lafayette LA. Ornithology. Jan 25-Apr 10 [69 works of art] (solo show). Curated by Brian Guidry. 2005. Clementine's: New Iberia LA. Burned Toast and cheese, Jan.-Apr [83 works of art] (solo show). 2004. Galerie Lafayette: Lafayette LA. The Gravy Train People and their Pets, Sept 8- Oct 19 [122 works of art] (solo show). Curated by Brian Guidry and Stephanie Patton. 2000. Opelousas Art Museum: Opelousas LA: NOMA Paintings Exhibit at OMA: Louisiana Contemporary Paintings by E.J. Martin & F. Pavy. May 18-Aug. 30 (two person show). 2000. Zigler Museum: Jennings LA: Acrylics on paper and canvas by E.J. Martin & C. Simms. 15 Jan-20 Feb (two person show). 1996. Cultural Center Oudenaarde: Oudenaarde, Belgium. Eugene J. Martin, USA. Drawings and paintings. May 31-June 14 [54 works of art] (solo show). 1994. Lilly Gallery, Duke University: Durham NC. Eugene Martin. Acrylic paintings on paper. Sept 12-Oct 24 (solo show). 1992. Horace Williams House: Chapel Hill NC. Art by Eugene Martin. Sept 6-30 [43 works of art] (solo show). 1990. Michel Rooryck Gallery: Ghent, Belgium. Eugene Martin: A Retrospective. Jan 12-Feb 11 [49 works of art] (solo show). 1988. DC Art Works: Washington DC. Eugene Martin's paintings on silk reproduced in Udaipur, India. Sept-Oct (solo show). 1988. DC Art Works: Washington DC. Eugene Martin's pen & ink drawings and paintings on silk reproduced in Udaipur, India. Aug (solo show). 1983. Decorative Art Department - Bloomingdales: Falls Church VA. Eugene Martin paintings (sold out) (solo show). 1982. Decoration of Restaurant 'The Breadoven': Washington DC. Paintings by Eugene Martin on silk reproduced in Udaipur, India (solo show). 2013. Parish Gallery: Washington D.C. Group of Gallery Artists. Feb. 1- Feb. 26. 2012. Acadiana Center for the Arts: Lafayette, LA. Reconfigure: Transformations of the Body. Aug. 11-Oct. 13 [17 works of art]. Curated by Mary Beyt and Brian Guidry. 2010. Parish Gallery, Washington DC. Summer Group Show. July 16-Sept. 14. 2009. Cecil College, MD. In Remembrance: Artists from the Paul R. Jones Collection. Jan. 17-Feb. 23 [3 artworks]. 2008. University of Delaware Museum, Mechanical Hall Galleries: In Remembrance: Artists from the Paul R. Jones Collection. Jan. 22-May 23 [3 artworks]. Curated by Janet Dees. 2006. Galerie Lafayette: Lafayette LA. Louisiana Gumbo. Summer [8 artworks]. Curated by Troy Dugas. 2005. Ogden Museum of Southern Art: New Orleans, LA. Spirit of Place - Art from Acadiana. May 5-Jul 24 [3 artworks]. Curated by David Houston. 2005. Ogden Museum of Southern Art: New Orleans LA. African-American artists from the permanent collection. July 28-Sept 24 [1 painting]. 2004-2005. Acadiana Center for the Arts: Lafayette LA. Spirit of Place - Art from Acadiana. Oct 16-Jan 10 [3 artworks]. Curated by David Houston. 1994. Chapel Hill Public Arts Commission, Exhibit at Town Hall: Chapel Hill NC. Sept 11-Dec. 11 [2 artworks]. 1994. Fridholm Fine Arts Gallery, Broadway Arts Building, Asheville NC. Eugene Martin: Acrylic paintings on paper. [6 artworks]. 1993. Fridholm Fine Arts Gallery, Broadway Arts Building: Asheville NC. Eugene Martin: pen & ink drawings. Nov 12-Jan 12 [18 artworks]. 1991. The Gallery, Broadway Arts Building: Asheville NC. Jul 5-Aug 24 [4 artworks]. 1991. Fourth Annual Afro-American Artists Exhibition, High Point Theatre Art Galleries, High Point, North Carolina, May 4-June 28 (Group show). 1991. University of North Carolina at Chapel Hill, Student Union Galleries: Viewpoints: Five Black American Artists. Jan 19-Feb 8 [6 artworks]. 1981. Corcoran Gallery of Art: Washington D.C. Works of Art from the Private Collections of the Friends of the Corcoran: 1961-1981. Jan 16-Feb 15 [1 Painting]. 1973. Ontario Gallery, Washington D.C.
1968. Jane Haslem Gallery, Washington D.C.
1966. Jane Haslem Gallery, Washington D.C.
1966. Ontario Gallery, Washington D.C.
1965. Georgetown Modern Gallery, Washington D.C.
1964. Georgetown Gallery, Washington D.C.
1964. Smith Mason Gallery, Washington D.C.
1961. The Coffee House, Washington D.C.
1960. The Coffee House, Washington D.C.
2013. The Art of Eugene Martin at the Ohr-O'Keefe Museum of Art, Biloxi, MS, (June 5-December 1, 2012), by Ashleigh Coren in Scene: Resisting homogeneity in the 21st Century. International Review of African American Art (IRAAA), Vol. 24 (2), pp. 9-10 (Fall 2012-Winter 2013). 2012. Martin, Eugene James, in African American National Biography, edited by Henry Louis Gates Jr. and Evelyn Brooks Higginbotham. Oxford African American Studies Center. Biographic entry by Marie Vinouze, November 16. 2012. Mention in The Shape of Things to Come, by John Haber, haberarts.com, November. 2012. Improvisations in Time: Eugene J. Martin and the Masur Museum of Art, by Benjamin Hickey (Improvisations in Time), Suzanne Fredericq (The In-Between in the Art of Eugene Martin) and Marie Vinouze (Life, Liberty and the Pursuit of Happiness). Preface by Evelyn Pell Stewart, Masur Museum of Art Press, 76 pp. ISBN-10: 0-615-66502-0. Click here for a pdf of catalogue. 2012. Tally Ho! Two Eugenes I Once Knew Eugene Walter and Eugene J Martin, Oct. 28. 2012. Oxford American, The only stair that doesn't creak: Eugene Martin, by Reggie Michael Rodrigue, July 17. 2012. The Geometric Unconscious - A Century of Abstraction. Edited by Jorge Daniel Veneciano, University of Nebraska Press, 208 pp. (mention on pp. 163, 167). 2012. Mobile Alabama Press-Register, Al.com: Ohr-O'Keefe exhibits artwork by Eugene Martin, by Thomas B. Harrison, June 24 (online June 22). 2012. Art E-Walk, New Orleans: Southern Exposure, by Sylvie Contiguglia, June 15. 2012. Mobile Alabama Press-Register, Al.com: Ohr-O'Keefe showcases artists with Southern roots, by Thomas Harrison (online May 31). 2012. Louisianaesthetic, South Louisiana: Mystical gathering: Eugene J. Martin and the Ohr-O'Keefe Museum of Art, by Reggie Michael Rodrigue, May 27. 2011. Eugene J. Martin (1938-2005), MS thesis by Marie Vinouze under the direction of Prof. Philippe Dagen, Université Paris 1 Panthéon-Sorbonne. Defended in September, mention Très Bien (with Highest Distinction). 155 pp. 2011. From Slavery to Freedom - A History of African Americans, by John Hope Franklin & Evelyn Brooks Higginbotham, McGraw-Hill, 9th Ed. (mention in Ch. 22, p. 602). 2011. Art E-Walk, New Orleans: Artist's studio, by Sylvie Contiguglia, May 28. 2011. Art E-Walk, New Orleans: Dancing String Bean and more at the NOAAM, by Sylvie Contiguglia, April 9. 2011. 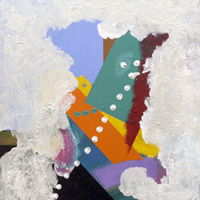 Art E-Walk, New Orleans: Abstract art in Baton Rouge, LA, by Sylvie Contiguglia, Feb. 20. 2011. The Advocate, Baton Rouge: Beyond Black - Exhibit features work of three African American abstract artists, by Robin Miller, Jan. 23. 2011. City Social, Baton Rouge: LSU Museum of Art: Beyond Black by Ashley Herrick, Jan.
2010. Eugene J. Martin (1938-2005) in Washington's DC's most wanted - the top 10 book of tourist treasures, powerful treasures, powerful politicians, and capital wonders, by Brigette Polmar & Norman Polmar, p.71 (under Artists). Potomac Books. 2009. Salt Lake City Examiner: qi peng interviews Suzanne Fredericq about Eugene James Martin, June 1, 2009. 2009. The Daily Advertiser: Black & White Exhibit highlights pen & ink drawings of Eugene J. Martin, by Judy Bastian, Jan. 4. 2008. Literaturkritik.de, nr. 4, April: Darf man sich ein eigenes Urteil über moderne Kunst erlauben? Zwei Bücher von Wolfgang Ullrich und Hanno Rauterberg ermutigen dazu. Kultur-und Medienwissenschaft; by Georg Patzer. 2008. The News Journal - Delaware online (DE): The abstract in African-American Art, by C. Yasiejko, Feb. 15. 2008. Chico News & Review (Chico, CA): Shaping his way. Well-traveled sculptor Jerry Harris settles into local art scene with new show and lecture, in Arts & Culture, by C.G.K. LaPado, Jan. 17. 2007. The Daily Advertiser (Lafayette, LA): Exhibit looks at Martin - Miss. museum celebrates late Lafayette artist, June 28. 2007. The Mississippi Press: WAMA hosts first abstract art exhibit, June 23. 2007. The Sun Herald (S Mississippi): Joyous Explosion, by P. Firmin, June 19. 2007. The Mississippi Press: The Walter Anderson Museum of Art presents Eugene James Martin: Man of Color in the Jo Love Little Gallery, June 22 - September 30, 2007, June 17. 2007. Ocean Springs Record (S Mississippi): Colorful WAMA exhibition to open, June 14. 2007. The Town Talk (Alexandria, LA): Seek just a little truth - Martin art collection to open at AMoA on April 27, by R. Miller, April 12. 2007. Ocean Springs Record (S Mississippi): Soulful sounds and scenes - MAMA Café Night salutes African-American artists, by V. Winn, Feb 22. 2007. Eugene James Martin in Le Petit Futé travel guide, p. 85. 2006. Direct Art Magazine (Fall/Winter), Vol. 1. Eugene James Martin - In Memoriam, pp. 86-87. 2005. The Independent (Lafayette LA): Flight Pattern-'Birdspace' spreads its wings at the Acadiana Center for the Arts, by Erin Zaunbrecher, March 2. 2005. The Daily Iberian (New Iberia LA): Artwork on display, by B.C. Clark, Feb. 3. 2005. The Times of Acadiana (Lafayette LA): Requiem in Abstract, cover story by D. Allen, Jan. 19. 2005. The Daily Advertiser (Lafayette LA): Martin's colorful art leaves lasting impressions, by H. Fuselier, Jan. 17. 2005. The Daily Advertiser (Lafayette LA): Memorial held today for noted artist, by B. Corbell, Jan. 5. 2004. The Independent (Lafayette LA): Train 'of thought', by E. Zaunbrecher, Sept. 8. 2004. The Times of Acadiana (Lafayette LA): An Artist at his work, by C. Durio, June 2. 2004. The Advocate (Baton Rouge LA): Confluence of Influences - Dalrympyle home merges wide variety of styles, furnishings, by Karen Martin, Feb. 23. 2000. The Sunday Advertiser (Lafayette LA): Free men of color, by J. Stanford, Jan 23. 2000. The Daily News (Jennings LA): Zigler plans spirited exhibit, by C. Tipper, Jan 9. 1996. Le Nouveau Courier (Belgian newspaper): Exposition Eugene J. Martin à Audenarde, by B.F.
1992. The Daily Tarheel (Chapel Hill NC): Energetic colors, abstracts, jazz up Horace House, by E. Williams, Sept. 10. 1991. Asheville Citizen-Times (Asheville NC): Broadway Arts bazaar offers overload, by Frank Thomson, July 21. 1991. Cue Magazine (Chapel Hill NC): group show review, Black artists exhibit at Carolina Union, 31 Jan.
1990. Het Laatste Nieuws (Belgian newspaper): Van Washington naar Gent, by N. Verschoore, Jan.
1990. Courrier de Gand (Belgian newspaper): Eugene J. Martin, by M.V.D., 19 Jan.
1990. Exhibition brochure, Eugene Martin, Michel Rooryck Gallery, Ghent, Belgium, by Bruno Fornari. 1990. Lecture about Eugene Martin exhibit by Eric Pil, Michel Rooryck Gallery, Ghent, Belgium, 11 Feb.
1986. The Carolina Quarterly, vol. 38(2): Reproduction of Artwork. 1985. Dean King: Honors Thesis, University of North Carolina at Chapel Hill: Seven American Artists, interview with Eugene Martin, pp. 54-66. 1985. The Cellar Door, Vol. 12(2): Reproduction of Quote. 1984. Interview with the Norwegian Radio Broadcast in Washington D.C. (summer 1984). 1974. Poet Magazine; Circle Magazine: Reproduction of Artwork. 1970. The Washington Post: A Textured Toughness, review of group show by P. Richards, July 12. Late 60'. Washington Evening Star: Article; Look Magazine. Eugene J. Martin is a possible answer in online Multiple Choice Quiz From Slavery to Freedom - A History of African Americans, by John Hope Franklin & Evelyn Brooks Higginbotham, McGraw Hill Higher Education, ed. 9 e.
Masur Museum of Art Curator Benjamin Hickey's Podcast Weblog Improvisations in Time: Eugene J. Martin and the Masur Museum of Art, Nov. 18, 2012.